If I have a project that deserves to be in the lovely year of finishes, it's this one. It's embarrassing how long this quilt has been hanging around. 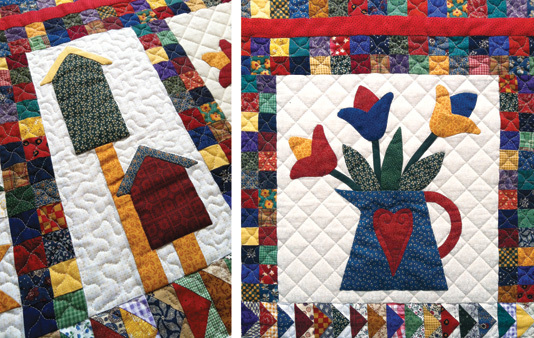 It's the very first quilt I made – maybe in 1999 – and I've never done the binding. Not only that, but now I've dragged it out again I've realised it still has one poor leaf that missed out on being appliquéd and it needs some buttons for the birdhouses. This quilt has been moved from the Central Coast to Wagga and a couple of different houses in Sydney, so it really is time it was finished. Some of you might look at this quilt and think, that's really not Tara's style, and you'd be right, which is probably why I've never got around to binding it. So why did I make it? Well I really wanted to learn how to make quilts and this project promised to teach all the different techniques in one go. 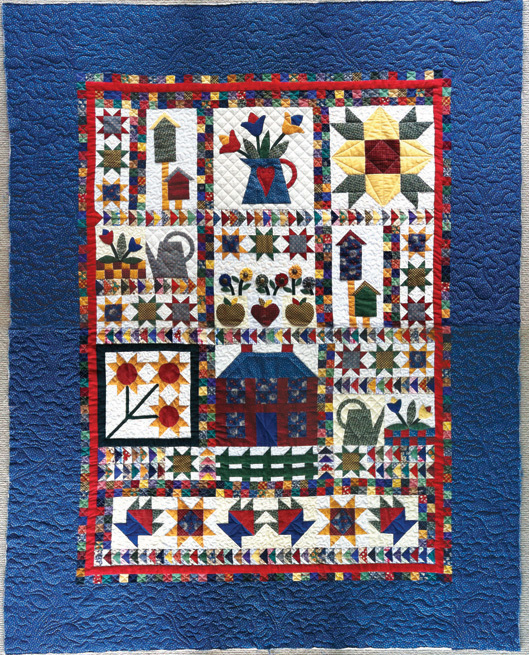 It includes flying geese, star blocks, suffolk puffs (or yo-yos), machine piecing, hand piecing and hand applique. A row of flying geese separating blocks. I don't really know what I'm going to do with the quilt when it's finished. I can't see myself ever hanging it, but I'm also not sure I could bear to give it away. The detail in the quilting is lovely. So often, the easiest thing to do is an all-over pattern, but this one has a different pattern stitched onto every block – I wish I could remember who did it! Just digging this quilt out again and looking at all the blocks and the pattern makes me remember all the evenings I spent sitting around chatting with the women in the class over cups of tea and the most amazing shortbread biscuits! Unfortunately, the business has since shut down, but I can still sometimes be transported back to that room on the sip of a chamomile tea. At left: the birdhouses in need of decoration. At right: Quilting detail. It's such a pretty quilt - even if it's not your style, but I agree, it would be hard to give away. 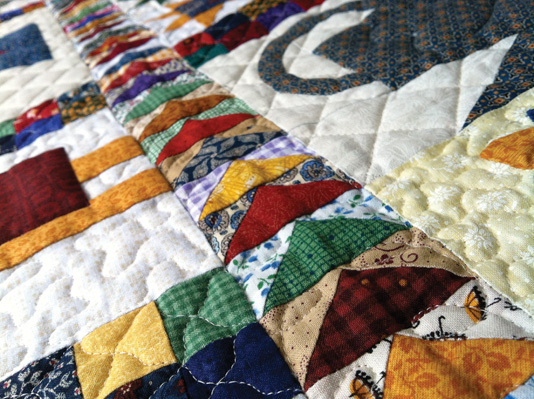 Our quilts hold so many memories. What a REALLY wonderful quilt! That's the wonderful thing about handworks, they bring us joy while we make them and even after when we just look at them. About waiting to finish the binding - Sometimes, I feel "nervous" or "leary" to finish something, for lots of reasons. One being that when it's finished...it can be like a book that we don't want to finish because we will miss all the characters that we've gotten to know. That's so true Annie... The quilts I've done as presents have all had a due date, but those that I've done for myself, or without a specific recipient in mind, have all been finished off at a VERY leisurely pace!